psplash is a simple splash screen that shows a static image with an animated progress bar. It is the default splash screen shown by any Poky based project, unless overridden. This post assumes you know how to override a recipe with a .bbappend file, add files to a recipe, and patch the recipe source. The directory structure for psplash in my own layer. I wanted to have my PiTFT 2.8 show the splash screen instead of the display plugged into the HDMI port of my Raspberry Pi 3. The HDMI display is identified in /dev/ as fb0, and the PiTFT screen is identified as fb1. The 320 x 240 splash screen. The very exciting progress bar splash screen which has a single pixel of white border around it. echo "Framebuffer /dev/fb0 not detected"
echo "Framebuffer /dev/fb1 not detected"
INITSCRIPT_PARAMS = "start 5 S . stop 20 0 1 6 ." This will run the psplash-init only after the /dev/fb1 is available (after udev). Adjust the runlevel values as necessary for your system. Refer to update-rc.d.bbclass chapter in Yocto documentation. Replacing the images is as simple as adding the new images to the files directory of the psplash directory of your layer. To remove the text bar altogether (and eliminating the black background box behind it, undefine the following environment variable. Setting the variable to empty string still produces the black background box above the progress bar, because the source code checks for any definition of the variable. Using Yocto I was able to build an image for the Raspberry Pi. I followed the instructions in a blog post on Jumpnow Technologies blog. This got me started on making progress. I built the basic console image as per instructions. It boots into the console and sets up the PiTFT 2.8″ display. The display is available as non-accelerated framebuffer on /dev/fb1, and fb0 remains as the main HDMI display. There is a blog post detailing how to get accelerated content on the PiTFT display here. Graphics acceleration ended up not being a requirement, however. I added snes9x-rpi from meta-game-emulators into the project. I patched the source code with the help of the Yocto devtool to make it compile correctly. The emulator uses the SDL library and runs games smoothly on the Raspberry Pi 3 (I upgraded). The snes9x-rpi emulator, when ran, complained about “No video mode large enough for 320×240”. I found this strange as my main display on the HDMI connector was 1600×1200 and displayed the console correctly. The PiTFT also has a resolution of 320×240. The solution was to add a .bbappend file for fbset-modes recipe to include the proper video mode definitions. To get the video mode definitions, run fbset -i -fb /dev/fb* where * is the number of the frame buffer you want to query. Append the output into /etc/fb.modes file. The file is left empty on purpose in the original recipe. # Intentionally overwrites the SRC_URI variable! The only purpose of fbset-modes recipe is to include this file. That is why I thought it appropriate to replace the variable contents. …and add alsa to the DISTRO_FEATURES variable in your local.conf or your image recipe. Be sure to include alsa-utils package to your image. It contains all the useful tools to control audio on your device. So I had a stray Raspberry Pi Model A hanging around in the cupboard which I stumbled upon just recently. Having dabbled with embedded Linux more and more recently, I figured this would be the perfect opportunity to start developing something interesting for it and put it to good use. I have always enjoyed gaming a lot, but I never got into portable gaming. Mobile games don’t really cut it, either. It has to be something like a GameBoy, but less bulkier. Like a Nintendo DS, but more versatile. Preferably the whole system would be under my control. And a ton of battery life… Like, a TON. As much as I can comfortably hold in my hands. I hate charging devices. I read about the topic for a while and came to the conclusion that it is very much possible to emulate older consoles on this hardware, and that software for that purpose has already existed for a long time. There are complete packages for Raspberry Pi that achieve this purpose, namely Retropie. Including this in the distro or adapting parts of it should be no problem. More of this later. To make it extra retro, it needs a proper display. Something low-powered and already with a fitting resolution, such as 320 x 240. A crisp TFT display was found, called PiTFT. 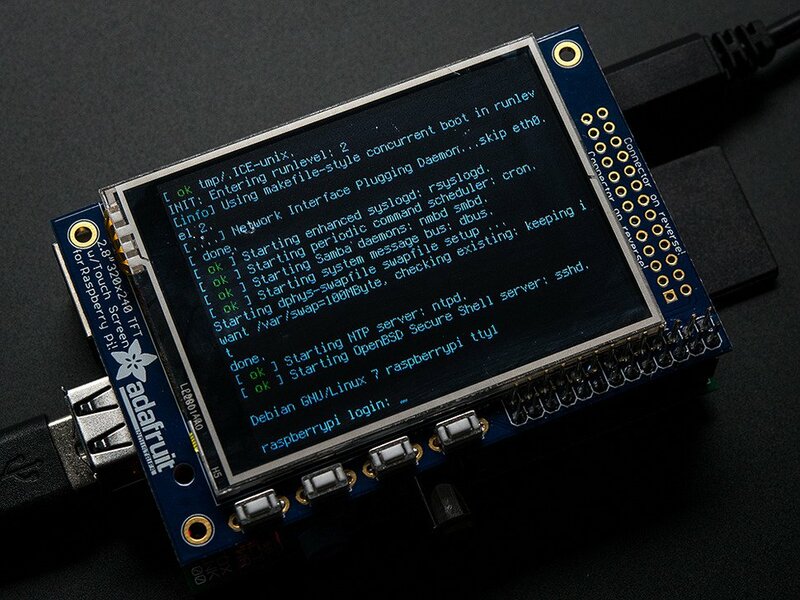 This uses the SPI bus to communicate with the Raspberry Pi. There are solutions to make the display support OpenGL accelerated sources, but that is beyond the scope of this post. It looks awesome. Perfect for some low-res gameplay. Other components of the system will feature small speakers, power management and distribution, and custom distribution for the Raspberry Pi. The controls will be modified later from an SNES USB controller. I’ll write a post regarding that later. Wanting full control of the software, nothing less than a completely custom embedded Linux distribution will suffice. This will be achieved with The Yocto Project. This will enable me to build a system fully configured to my specific needs, and it’s perfect practice for bigger projects in professional environments. I’ll update the blog with baby steps as I go figure the whole thing out. I suppose I have to start somewhere, might as well do it now. The site has really been empty for a long while now and I’m looking into changing that soon. I have a few personal projects in mind and I was thinking I’d post some progress updates here as they go forward. Might also involve random programming related posts.